Four billion years ago, our then stripling sun radiated only 70 to 75 percent as much energy as it does today. Other things on Earth being equal, with so little energy reaching the planet's surface, all water on the planet should have been frozen. But ancient rocks hold ample evidence that the early Earth was awash in liquid water – a planetary ocean of it. So something must have compensated for the reduced solar output and kept Earth's water wet. "There is no geologic evidence in these rocks for really high concentrations of a greenhouse gas like carbon dioxide," said Dennis Bird, professor of geological and environmental sciences. Instead, the team proposes that the vast global ocean of early Earth absorbed a greater percentage of the incoming solar energy than today's oceans, enough to ward off a frozen planet. Because the first landmasses that formed on Earth were small – mere islands in the planetary sea – a far greater proportion of the surface of was covered with water than today. The study is detailed in a paper published in the April 1 issue of Nature. 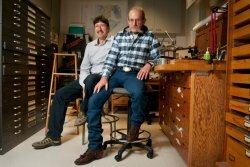 Bird and Norman Sleep, a professor of geophysics, are among the four authors. The lead author is Minik Rosing, a geology professor at the Natural History Museum of Denmark, University of Copenhagen, and a former Allan Cox Visiting Professor at Stanford's School of Earth Sciences. "It's the same phenomenon you will experience if you drive to Wal-Mart on a hot day and step out of your car onto the asphalt," Bird said. "It's really hot walking across the blacktop until you get onto the white concrete sidewalk." Another key component of the theory is in the clouds. "Not all clouds are the same," Bird said. Most nuclei today are generated by plants or algae and promote the formation of numerous small droplets. But plants and algae didn't flourish until much later in Earth's history, so their contribution of potential nuclei to the early atmosphere circa 4 billion years ago would have been minimal. The few nuclei that might have been available would likely have come from erosion of rock on the small, rare landmasses of the day and would have caused larger droplets that were essentially transparent to the solar energy that came in to Earth, according to Bird. "We put together some models that demonstrate, with the slow continental growth and with a limited amount of clouds, you could keep water above freezing throughout geologic history," Bird said. "What this shows is that there is no faint early sun paradox," said Sleep. The rocks that the team analyzed are a type of marine sedimentary rock called a banded iron formation. It is characterized by thin alternating bands of quartz, magnetite, an iron-rich mineral, and siderite, a mineral with a high carbon content, but also some iron. "Any rock carries a memory of the environment in which it formed," Rosing said. "These ancient rocks that are about 3.8 billion years old, they actually carry a memory of the composition of the ocean and atmosphere at the time when they were deposited." The critical part of the rocks' memory was the banding and that iron was found chemically bound to oxygen rather than CO2 in the bands. The alternating bands would only have been deposited if the carbon dioxide content of the atmosphere kept shifting back and forth across a threshold that controlled which mineral was deposited. But that also meant that the amount of carbon dioxide couldn't stray too far from that threshold. If there had been either substantially more or less carbon dioxide, only one of the minerals would have been laid down. But to thrive, methanogens need a balanced diet. If the concentration of either of their foodstuffs veers too far below their preferred proportions, methanogens won't survive. Their dietary restrictions, specifically the minimum concentration of hydrogen, provided another constraint on the concentration of carbon dioxide in the atmosphere, and it falls well below the level needed for a greenhouse effect sufficient to compensate for a weak early sun. "The conclusion from all this is that we can't solve a faint sun paradox and also satisfy the geologic and metabolic constraints by having high carbon dioxide values," Bird said. "The lower albedo counterbalanced the fainter sun and provided Earth with clement conditions without the need for dramatically higher concentrations of greenhouse gasses in the atmosphere," Rosing said.